G. Knerd » I Did It! When I last left all of you, it was Friday night and I was waiting for the left sleeve to dry so I could pick out the grafted seam, knit another repeat of the pattern, and then try blocking it again – this time with the requisite twelve points (as opposed to the eleven I’d actually done). Saturday morning, I woke up excited to fix the mistake I’d made, sure that I still had a chance to get this thing handled. I’m going to point out again that there are a lot of things I’d do differently if I did this pattern again (like, say, learn to count past 10? 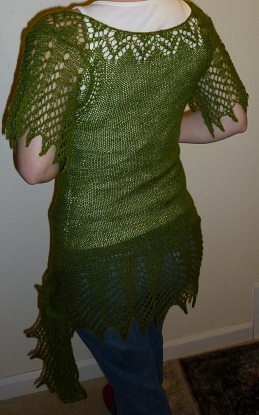 ), and blocking before the fabric is doubled is only one of them. If for nothing else, it would allow me to recover from my mistakes faster. 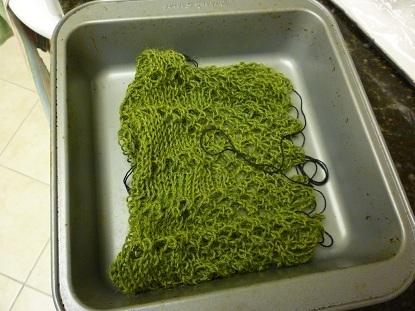 In desperation, I recalled a post from the Yarn Harlot, where she put her knitting in the oven in order to dry it more quickly. I was in so much of a hurry that I didn’t even look up the post to figure out the details (I looked it up just for this post), I just turned the oven on as low as it would go and shoved the knitting in. It took about twenty minutes before the combination of wanting to make progress and fear of scorching the yarn combined to make me take it out. Frankly, it was still a little damp at that point, but…yeah, I needed to move on. 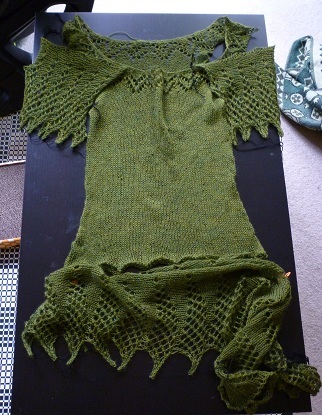 The next hour or so was spent correcting my (stupid) mistake, after which the sleeve went back into the water and was ruthlessly pinned out for blocking, with a fan blowing across it and the rest of the pieces (which, surprise, surprise, also weren’t dry yet due to their doubled nature). Sunday morning, I woke up as early as I could stand it, pulled the blocking needles out, and got ready to do some serious seaming. I only had to go back and redo part of a seam once due to lack of counting (note to self: if the ratio is 4:5, grafting 1:1 will not work. at all.). It was down to the wire, but with about 15 minutes to spare before the Closing Ceremonies started, I snipped the thread for the last end after weaving it in. I did it. Somehow. 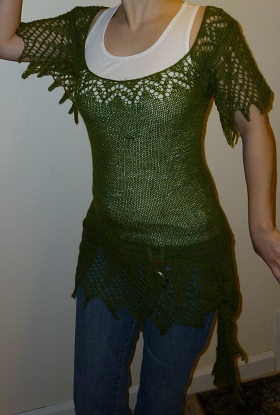 I was surprised at how relieved I was, how important I’d let the Knitting Olympics become. It seems like all I’ve been finishing lately have been things for the feet, and it’s nice to know that, when push comes to shove, I really can actually finish something that goes on my torso. Also, it doesn’t look too bad. Not like I was picturing in my head, and I’ll certainly need to find a shirt that will work underneath it, but…not bad at all. As you might have noticed, I’m not quite thrilled with the way the pattern is written, and if I were to do it again, I’d make even more modifications than I did already. The results are lovely, but I feel like they could have been lovelier if I’d done a few other things to rework the pattern. Also, you know, if I’d been able to tell the difference between a size 9 (5.5 mm) and size 10 (6.0 mm) knitting needle – I was supposed to go from 9s to 10s after the yoke, but ended up going from 9s to 9s. That was kind of pointless, but luckily it doesn’t seem to have hurt the finished project too much. But really, the most important lesson? Learn to count past ten before you take on a major project. Seriously. And eleven really doesn’t equal twelve, no matter how much you want it to. Posted: March 1st, 2010 under Uncategorized.